Composite fillings can be closely matched to the color of existing teeth. 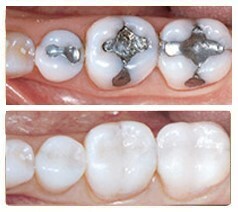 Bonding to tooth structure: Composite fillings micro-mechanically bond to tooth structure. To treat a cavity, Dr. Jeturian will remove the decayed portion of the tooth and then “fill” the area on the tooth where the decayed material was removed. Fillings are also used to repair cracked or broken teeth and teeth that have been worn down from misuse (such as from nail biting or tooth grinding).